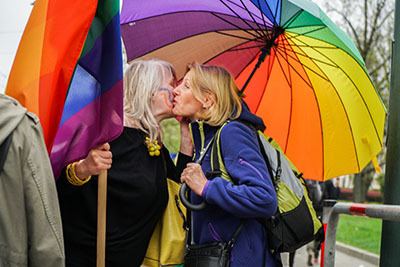 There is Pride in Eastern Europe, but it exists only under the weight of a military boot, in a legal system where it’s against the law to be married to the one you love or even enter into a civil union. Showing your Pride in these countries means to risk getting egged, shoved, shouted down or otherwise ridiculed. 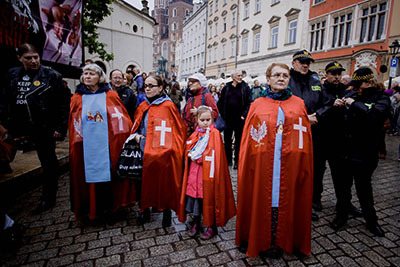 Not to mention those who will pray for us, publicly, with big crosses and antigay signs. 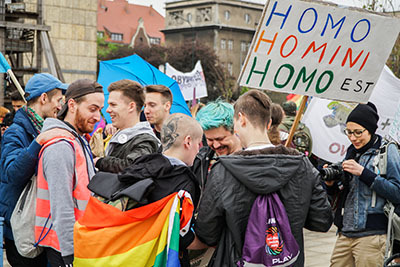 Many eastern European countries — including Bulgaria, Latvia, Lithuania, Poland, Romania and Slovakia — still deny homosexuals the right to marry or enter into unions. 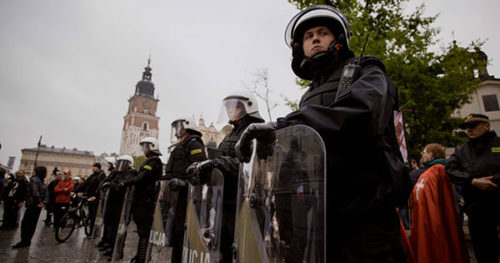 Those laws did not prevent peaceful demonstrations this past March in Krakow, Poland, where the Equality March was held. 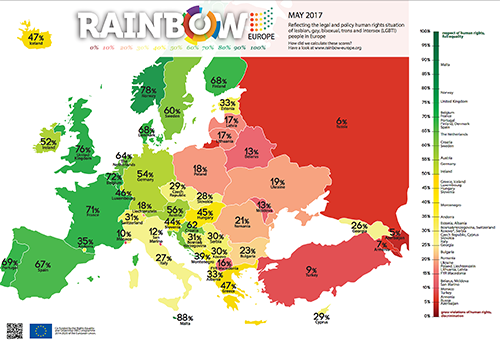 According to Ilga-Europe, an advocacy group in Brussels, reports Latvia, Lithuania, and Poland still show the least respect of all EU countries toward what the group called “sexual minorities,” meaning the LGBTQ community. That’s indicated by a huge blob of red on a map the NGO released, which ranked countries on the basis of laws and policies that impact LGBTQ people’s rights on the issues of equality, non-discrimination, family, hate speech and violence. Red represents the lowest percentage of compliance, green being the highest. 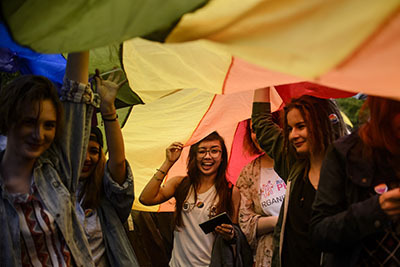 Romania’s Pride celebration on Saturday pitted members of and advocates for the LGBTQ community against conservative Christian opponents who preceded them with a counter-demonstration. People walk holding a large rainbow flag during a Gay Pride Parade in Bucharest, Romania, Saturday, May 20, 2017. 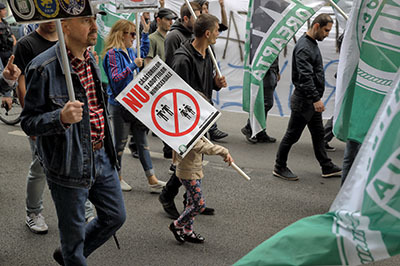 As NewNowNext reported, the march through central Bucharest was festive apart from a moment of silence outside the Russian Embassy, where demonstrators stood in solidarity with gays and bi men being detained, tortured and killed in Chechnya. 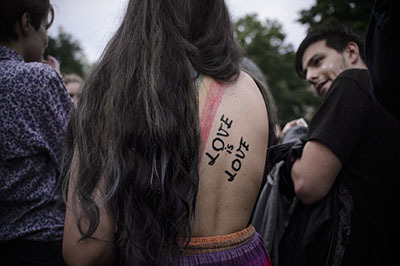 A young woman with a rainbow flag and the text “Love is Love” painted on her back takes part in a Gay Pride Parade in Bucharest, Romania, Saturday, May 20, 2017. A child walks with anti-gay protesters holding a banner that reads “No to homosexual marriages and adoptions” during a march ahead of a gay pride parade in Bucharest, Romania, Saturday, May 20, 2017.